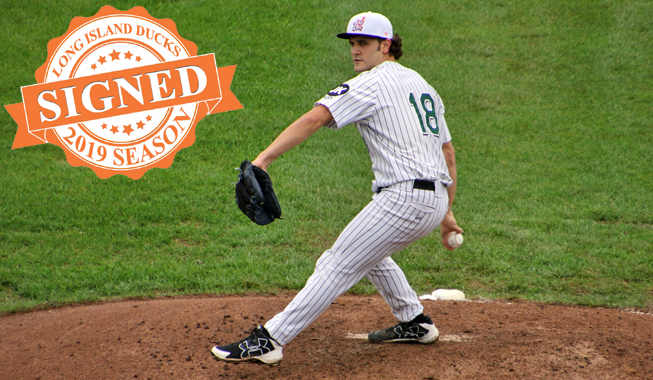 (Central Islip, N.Y., March 21, 2019) – The Long Island Ducks today announced the signing of right-handed pitcher Brett Marshall. The former Major Leaguer enters his second season with Long Island, fifth in the Atlantic League and 12th in professional baseball. Marshall returns to the Flock after making three regular season starts in September of 2018. The righty went 1-1 with a 4.26 ERA, striking out 12 batters over 12 and two-thirds innings. He then started Game Three of the Atlantic League Championship Series at Somerset, yielding three runs over five and one-third innings of work. Prior to joining the Ducks, the 28-year-old split time with the Sugar Land Skeeters and Southern Maryland Blue Crabs. He combined to start a league-high 25 games overall in 2018, compiling a 4.56 ERA, two complete games, 132.1 innings pitched and 108 strikeouts, good for third-most in the league. The Texas native reached the Major Leagues with the New York Yankees in 2013. In three relief appearances, he conceded six runs over 12 innings of work while striking out seven batters. One year prior, Marshall earned MiLB.com Organization All-Star and Eastern League Mid-Season All-Star honors with the Double-A Trenton Thunder. That season, he went 13-7 with a 3.52 ERA and 120 strikeouts over 27 starts. In four Atlantic League seasons (2015-18), he has accrued a 23-23 record, a 4.14 ERA, 389 innings pitched and 278 strikeouts over 72 games (69 starts). Marshall was originally selected by the Yankees in the sixth round of the 2008 amateur draft.